An elegant and practical favor, our letter openers are a great gift no matter what you're celebrating! 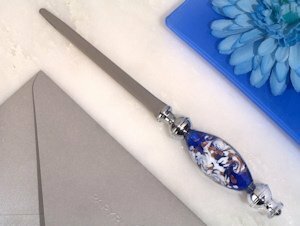 Each Murano-inspired piece features a handcrafted glass charm that is designed with blue and white swirls and accent with a touch of gold on the handle of the chrome metal opener. The 7" long favors arrive ready to give in white gift box with a satin lining.